Research* shows that when parents and other adult family members meaningfully engage in children’s learning, they play a vital role in enabling children to succeed in school and later in life. PIP nurtures parents’ critical role as their child’s first and most important teachers. 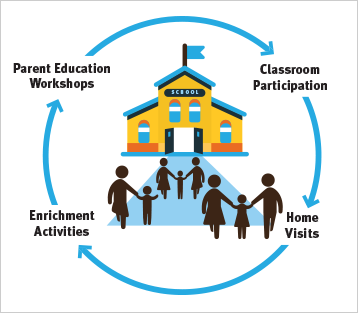 PIP supports parents through a model of four closely linked and integrated components, as depicted in this graphic. Parents engage in meaningful and skill-enhancing activities with their child and other children in the context of the classroom. Caring and supportive teachers model positive and responsive adult-child interactions for parents to practice in the classroom and at home. Presenters, often community members from public agencies, who have expertise in their subject matter provide strategies and guidance for parents to support children’s learning and development across four domains: cognitive, language and literacy, social-emotional, and physical development and health. Parents are encouraged to actively participate at each workshop to make it a more engaging experience. PIP Home Visitors develop warm, mutually respectful relationships with families to enhance parent-teacher-child connections and communication. Home visits focus on supporting parenting skills and practices to support children’s early learning. Field trips and school-site presentations build on children’s curiosity and enable parents and children to share learning experiences away from the classroom. Activities leverage community resources, link to classroom learning, and are designed to be interesting, enjoyable, and to encourage families to seek these kinds of activities on their own. Parents sign a Parent Agreement at the beginning of the school year and commit to participate in the child’s classroom one session each month, attend not less than eight parent education workshops, host six home visits, participate in enrichment activities as their schedules permit, and regularly practice the parenting skills they have learned. A district administrator, who has oversight of the preschool program, serves as the PIP Program Supervisor and works to maintain the quality of PIP activities while aligning them with the regular educational program. The PIP Facilitator, who, working collaboratively with district staff, manages the day-to-day aspects of what PIP provides. The PIP Home Visitor focuses on the home-visit component, linking the knowledge and skills parents acquire through the parent education workshops and classroom participation. Teachers encourage parents’ participation in the classroom and communicate regularly with PIP staff regarding the needs of individual children and families. PIP’s strongest advocates may be school principals and district administrators who can attest to how well the PIP components are being implemented, build enthusiasm among school staff, and help instill a strong culture for parent participation. evaluates project performance to validate outcomes and identify areas for quality improvement. This project has been made possible in part by a grant from an advised fund of Silicon Valley Community Foundation. Dunst, C. J., Bruder, M. B., Trivette, C. M., & Hamby, D. W. (2006). Everyday activity settings, natural learning environments, and early intervention practices. Journal of Policy and Practice in Intellectual Disabilities, 3(1), 3–10. Halgunseth, L. C., Peterson, A., Stark, D. R., & Moodie, S. (2009). 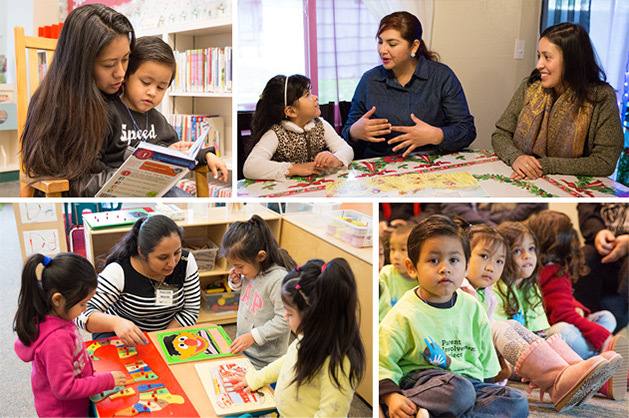 Family engagement, diverse families, and early childhood education programs: An integrated review of the literature. Washington, DC. WestEd staff will present on efforts to nurture parents’ critical role in the education of their preschool children. PIP highly values the concept of parents being their children's first and most important teacher.